Did you know our Artistic Director Susan Duprey lives on Oʻahu and flies to Kona for our Wednesday rehearsals every week? You can help with our “Flying Fund” by donating any amount of your Hawaiian Airlines Miles! A collective contribution of 15,000 miles will pay for one round trip ticket. We pool the donations to provide for the tickets. Any HawaiianMiles member can give any amount of miles to a Hawaiian Airlines Visa cardholder — free of charge. You can also donate money specifically for Susan’s flights. Please email konachoralsociety@gmail.com if you are interested in donating miles to the Flying Fund! Mahalo for this wonderful support! Mahalo to our “Flying Fund” donors! FY 2017 – Susan & Bryan Duprey, Joan Parker, Sue Welter, Melinda Baum, John Baum, Barbara Kuehner, Linda Raquinio, Ray Raquinio, Jane Mowry, Roger Weiss, Katherine Fraser, Noriko Ostrem, Linda Albers, Darl Gleed. 2015 – 2016 – Susan & Bryan Duprey, Wanee McCabe, Joan Parker, Joann Roberts, Carolyn D. Sanders, Jacqueline P. Sanders, Raymond P. Sanders, Deb Sims, Lydia Weiss, Roger Weiss, Anonymous x 3. 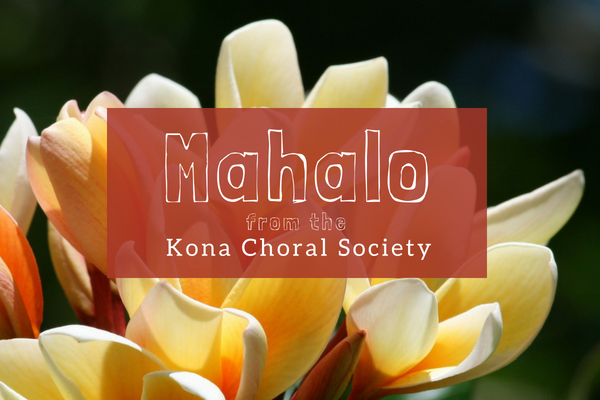 When you #StartWithaSmile, Amazon donates 0.5% of the purchase price to Kona Choral Society Inc. Bookmark the link below and support us every time you shop.